The first six months after the attack on Pearl Harbor were dark days for the American public. The Japanese war machine seemed unstoppable with the fall of the Philippines, Burma and Singapore. The Dutch East Indies and the Solomons would also fall. Japanese air attacks had already taken place on Darwin, Australia. A Japanese sub even managed to surface off the coast of California and shell targets on the coastline. Rommel’s Afrika Corps were pushing steadily eastward towards the Suez Canal. The German U-boat offensive in the Atlantic was taking a tremendous toll on shipping. The Japanese had landed on New Guinea and with the establishment of a major base in Rabaul in the Solomon Islands, Australia’s populous east coast could fall under striking range. As JP Santiago explains in an interesting article appeared on his website Tails Through Time, Already the carriers Enterprise and Yorktown had conducted a diversionary raid in the Marshall Islands and it was left to the carrier Lexington to make a diversionary raid several weeks later against Rabaul. On Feb. 20, 1942 the Lexington was steaming 400 miles northeast of Rabaul when the Grumman F4F Wildcats from Fighter Squadron 3 (VF-3) led by Lt. Commander John Thach were scrambled to intercept a Kawanishi H6K “Mavis” flying boat that had spotted the carrier strike force. Despite shooting down the flying boat, the position of the Lexington had been given away and later that afternoon, a formation of nine Mitsubishi G4M “Betty” bombers approached the carrier at 11,000 feet. Despite the shootdown of four of the bombers by the Lexington’s combat air patrols, five of the bombers made a level bombing run against the carrier. Waiting until the bombs had been released before making sharp turns, the Lexington escaped damage. 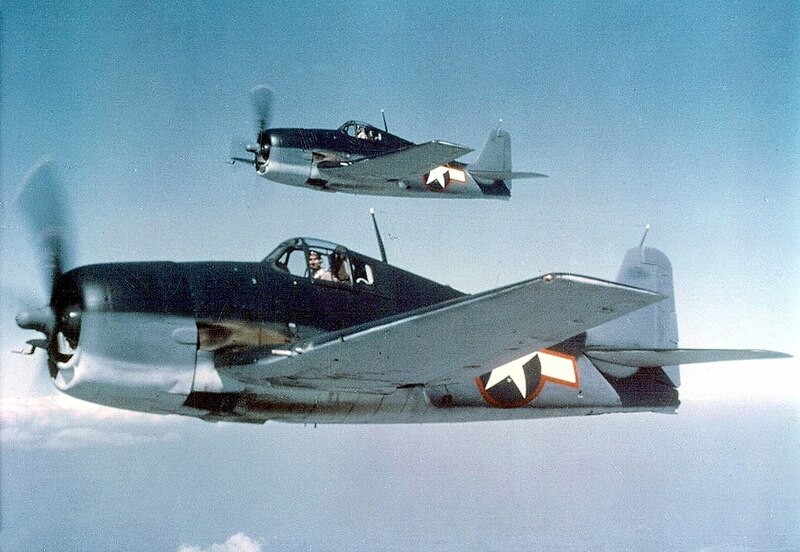 Unfortunately, a second flight of nine G4M bombers approached and this time only two of the Lexington’s F4F Wildcat fighters were in a position to intercept the incoming Bettys. 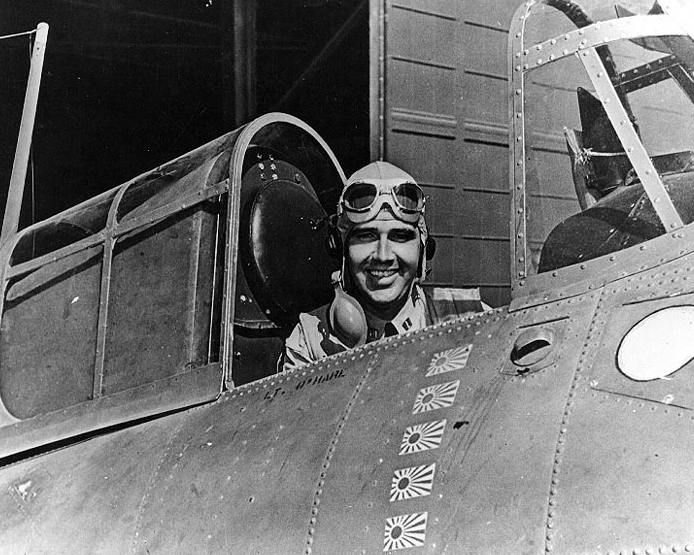 One of those Wildcats was flown by Lt. Edward H. “Butch” O’Hare. 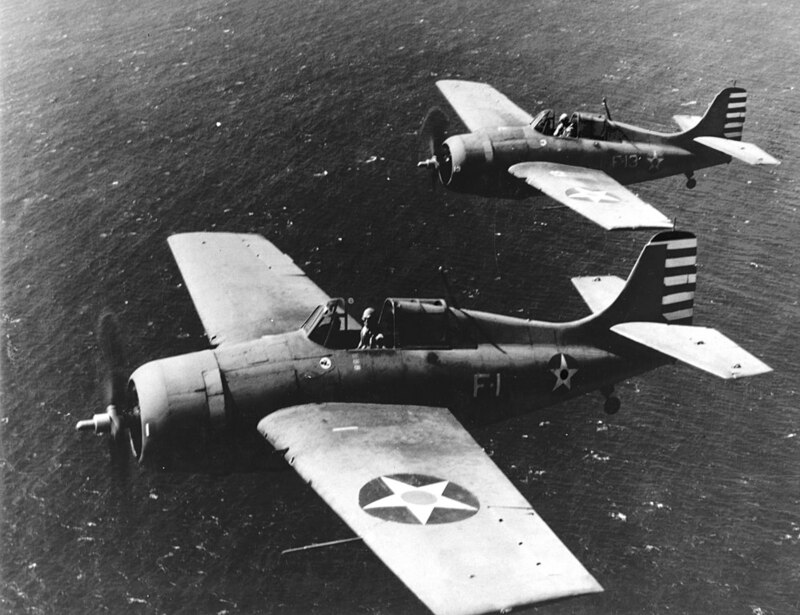 Two U.S. Navy Grumman F4F-3 Wildcat Fighting Squadron 3(VF-3) in flight near Naval Air Station, Kaneohe, Oahu, Hawaii, on Apr. 10, 1942. The planes are BuNo 3976 (F-1, foreground), flown by VF-3 Commanding Officer Lieutenant Commander John S. Thach, and BuNo 3986 (F-13), flown by Lieutenant Edward H. O’Hare. O’Hare firewalled his Wildcat and made directly for the bomber formation that was only minutes away from their bomb run on the Lexington. The Betty had a 20mm cannon tail gun and four machine gun defensive positions. Well-known for his marksmanship, on O’Hare’s first pass on the V-shaped formation, two bombers fell to his guns. He then pulled the Wildcat into a tight turn for another pass at the formation and downed three more bombers, all of this action taking place in sight of the sailors onboard the Lexington. O’Hare’s commanding officer, John Thach, joined the fight and downed several more bombers before scattering the formation as it beat a hasty retreat from the vicinity of the Lexington. 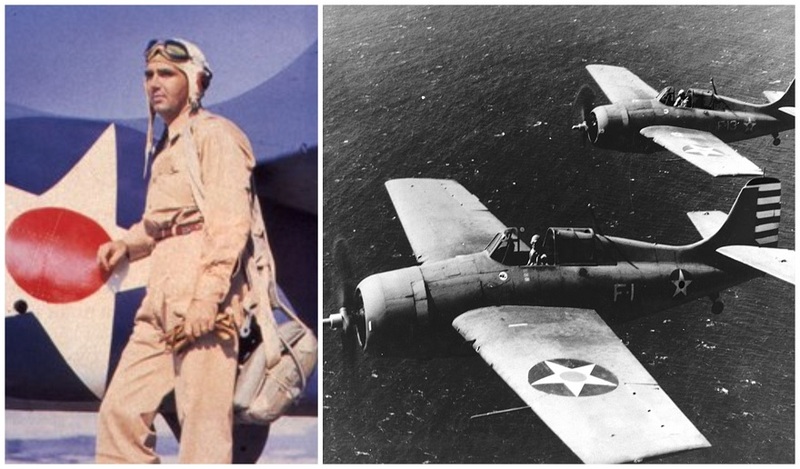 In the space of only four minutes, Butch O’Hare become the first US Navy ace, saving the Lexington in the process. According to Thach, O’Hare had expended only sixty rounds of 0.50-caliber ammunition in the process! 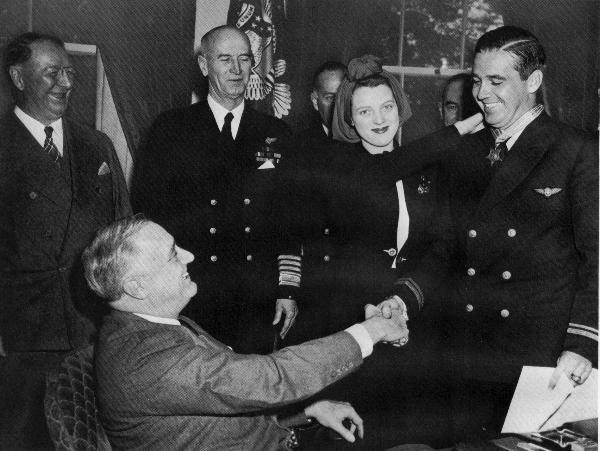 As explained by Michael O’Leary in his book United States Naval Fighters of World War II in Action, the captain of the Lexington, Frederick Sherman, recommended O’Hare for the Congressional Medal of Honor for his actions that day, but O’Hare had refused, insisting to his captain that any one of his squadron mates would have done the same thing. But with the raid on Rabaul called off due to the loss of the element of surprise and the constant stream of bad news arriving from the Pacific and Europe, O’Hare became an instant hero- he was young, dashing, and was the recruiting poster boy for naval aviation. He was summoned to the White House in April 1942 by President Franklin D. Roosevelt to receive the Medal of Honor. In June 1942 O’Hare relieved Thach as the skipper of VF-3 and the following spring the squadron swapped designations with VF-6 as O’Hare converted to the more powerful Grumman F6F Hellcat. Embarked on the USS Independence with future ace Alexander Vraciu as his wingman, O’Hare would add to his score with several more victories during operations against Wake Island. Following action over Wake Island, O’Hare was promoted to be the new CAG (commander air group) for Air Group 6 aboard the USS Enterprise. At the time the Navy was concerned about single or dual aircraft attacks at night when the carrier battle group’s defenses were at their most vulnerable. O’Hare had come up with an innovative idea to use a radar-equipped Grumman TBF Avenger orbiting over the carrier at night. On each wing of the Avenger would be Grumman F6F Hellcats who would be cued into the night intruders by the crew of the Avenger. On Nov. 26, 1943 O’Hare took up one of the Hellcats along with the radar-equipped Avenger and a second Hellcat to patrol the dark skies over the Enterprise. With some initial difficulties getting the formation coordinated with incoming bombers detected on radar, Butch O’Hare’s Hellcat would slide out of the formation that night and disappear. It had been thought for years that he had gotten caught in the crossfire between the Avenger’s gunner and Betty bomber and was hit inadvertently by the Avenger’s gunner. However, later research that involved interviews with the surviving crew members of that formation indicate that O’Hare most likely had been downed by a lucky shot from a Betty gunner. Though declared missing in action, he was declared dead a year later. In his honor in 1947, Orchard Depot Airport in Chicago was renamed O’Hare Airport and its prior name is the reason why O’Hare’s three letter code is ORD. In Terminal 2 of Chicago O’Hare is a restored Grumman F4F Wildcat painted in the colors of Butch O’Hare’s aircraft during his Medal of Honor mission. As an interesting historical side note, O’Hare’s father “Easy Eddie” O’Hare was known as Al Capone’s lawyer in the 1920s. Urban legend has it that a crisis of conscience in teaching his son Butch about right and wrong led the elder O’Hare to turn informant on Capone that led to the gangster’s imprisonment on tax evasion charges. However, it may have been more a matter of survival for the elder O’Hare as he had offered to meet with the IRS after the 1929 St. Valentine’s Day massacre in which rival gang members were brutally executed. O’Hare turned over extensive records that helped convict Al Capone in 1933. In November 1939, Eddie O’Hare was on his way home from the dog track when he was gunned down and killed in his car in a murder that to this day remains unsolved.